Hey friends! I hope you had a chance to check out yesterday's blog post for an introduction to Lularoe with Jenna Green plus a giveaway to win a Carly dress of your own! Be sure to check out that post for all about the details and how to win. 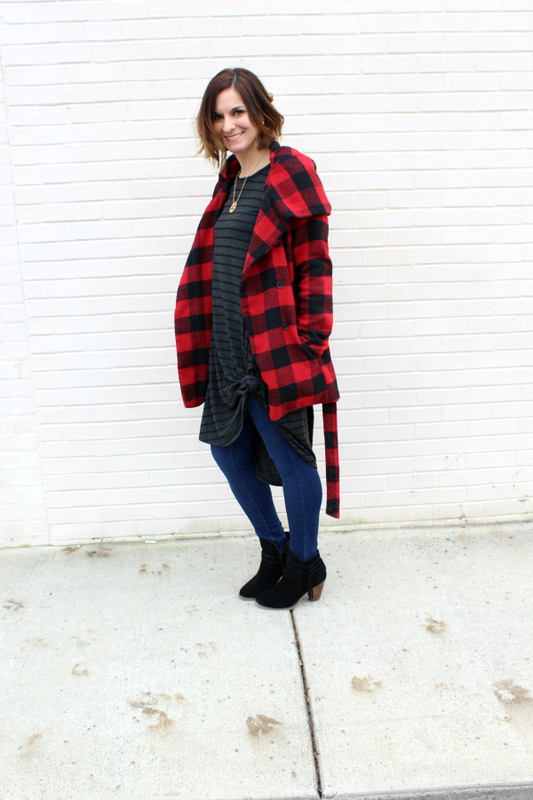 Today, I am going to be remixing the Carly and Sarah to show y'all just how versatile these pieces are in your wardrobe! I seriously have had so much fun putting these outfits together and I wish I could share every single way you could wear these comfy pieces. There's just too many! 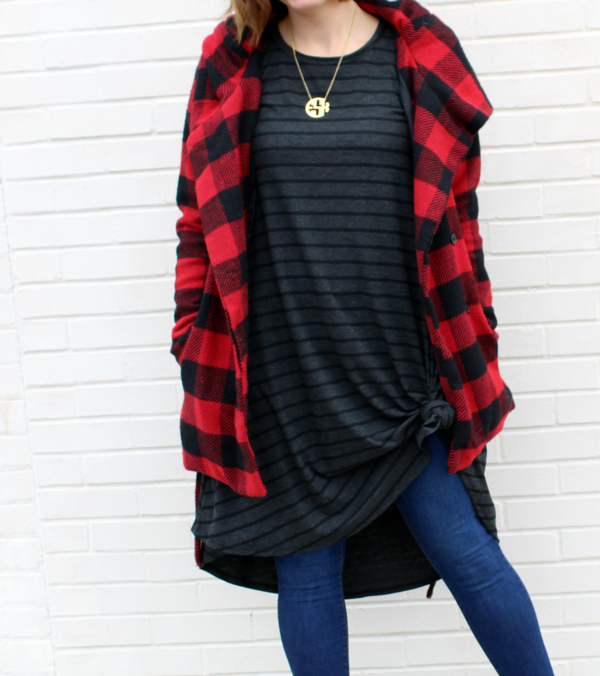 I remixed the Carly, a high low hem swing dress, with skinny jeans and by tying a knot for a different look! For size reference, I'm wearing a size XXS in this dress. 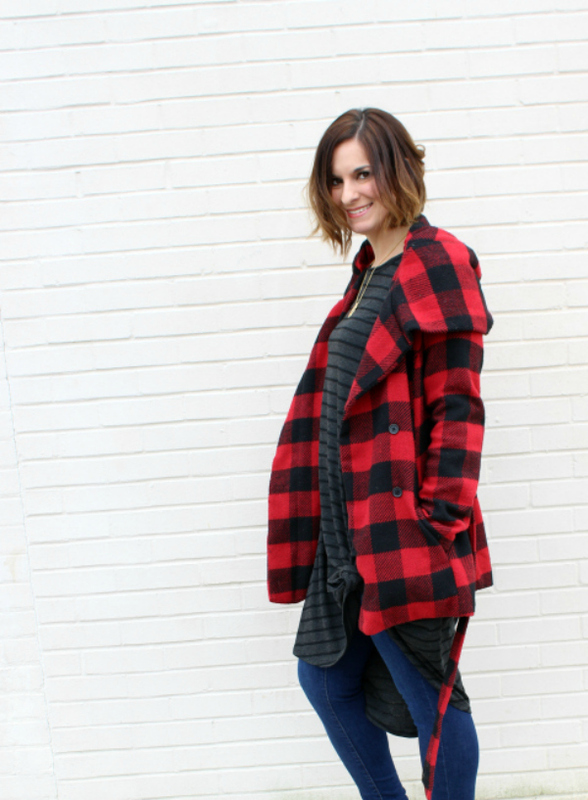 I added my cozy buffalo plaid coat to make the look winter friendly. 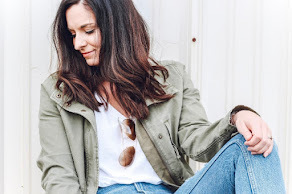 The Carly is definitely a year round piece that you could wear all spring/summer long with sandals or wedges, during the fall with a lightweight cardigan (like the Sarah), and through the winter with a coat, jeans, and ankle boots like I did. I was even able to incorporate some pattern mixing in this look! 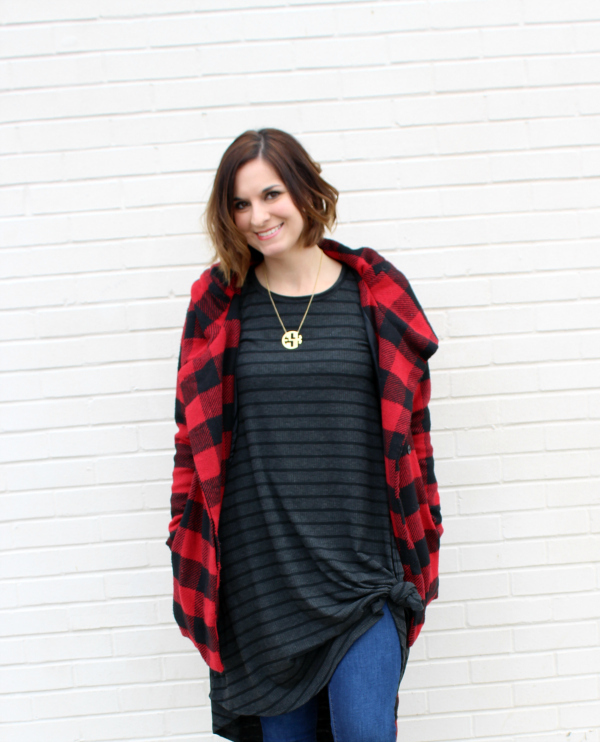 I love the striped Carly with buffalo plaid. 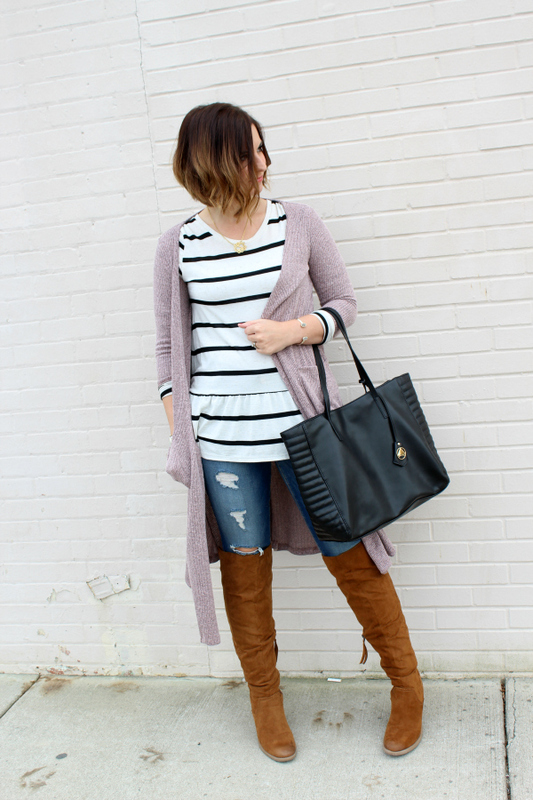 I also remixed the Sarah, a long duster style cardigan, with distressed skinny jeans, over the knee boots, a striped peplum top, gold jewels, and a black tote. For size reference, I am wearing a size XS in this cardigan. I absolutely love the lavender color! It adds a subtle pop of color to a cold weather look. 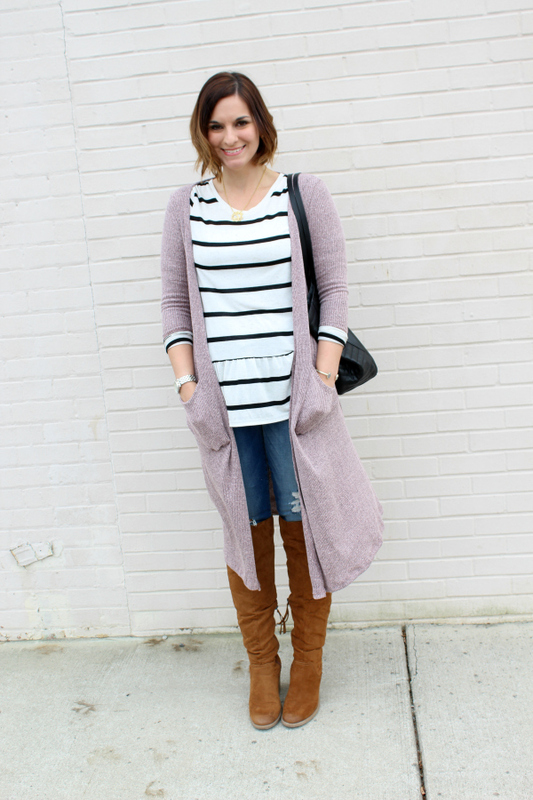 This cardigan is also super versatile (like all Lularoe) because you can pair it with a dress (like I did yesterday) or layer it over a long sleeved tee like I did here. 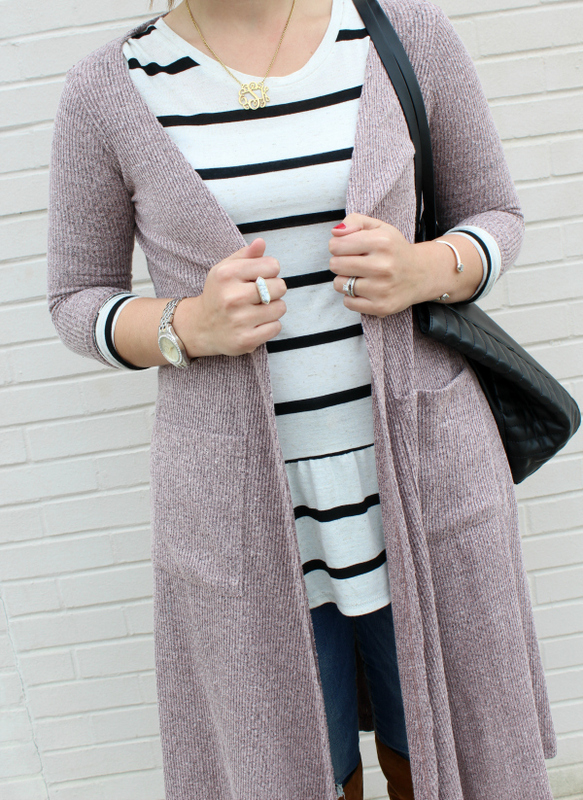 This cardigan is also perfect for transitional weather because it would be perfect to throw over a sleeveless summer dress for cooler nights or wear over a graphic tee for a chilly fall morning. This Sarah will be on repeat all year long! I have absolutely loved styling Lularoe for y'all! I love how comfortable and versatile this brand is. Be sure to enter the giveaway on Instagram for a chance to win your own Carly dress! You can shop both Lularoe pieces that I styled today here plus so much more! Have a great day, y'all! 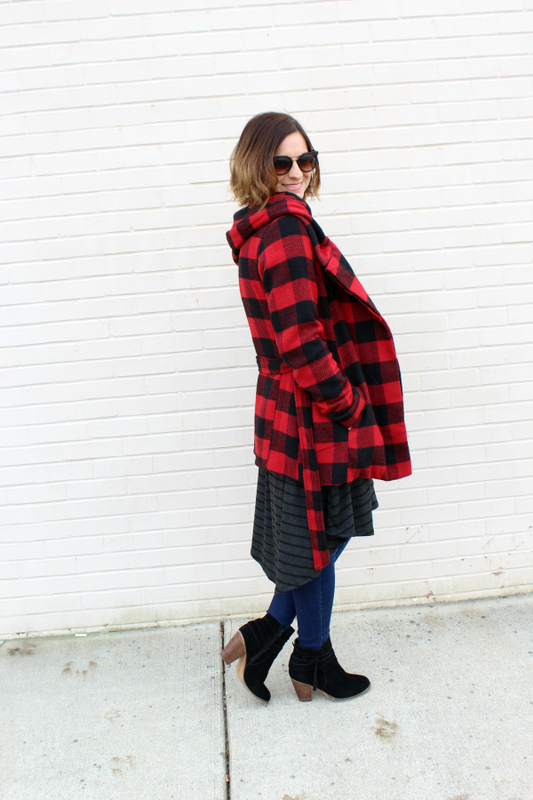 I love that buffalo plaid jacket! Looking great girl!